ImmunityEd is a system designed to aid parents in making informed vaccination decisions and easily keep track of vaccination records for their children. The aim of the system is to foster longitudinal rather than granular understanding about their child's vaccinations and health through access to scientifically valid sources, a comprehensive vaccination checklist, appointment reminders, engagement with data, dialogue, and community. More holistically, the system is designed to embed and normalize new immunizations as they become available. The current aim is to specifically raise HPV vaccination rates, but as history has shown us, there will always be new important immunization discoveries, and the system takes that future into account. Brief: Design a visual communication system to help raise HPV vaccination rates in Allegheny County. ImmunityEd's primary touchpoint is an interactive smartphone app that encourages parents to keep records of their child's immunizations through individual child profiles, appointment reminders, and alerts about school vaccination requirements. The app also includes informational videos about each vaccine along with written communication, as well as a CDC/NIH/ACHD newsfeed meant to familiarize parents with the ever changing landscape of doctor recommendations and health news. The ImmunityEd system includes a physical folder constructed from sturdy plastic with a newly designed CDC vaccination schedule and record on the inside cover. The folder seeks to serve as the primary motivator for downloading the smartphone, a place to begin the discussion of vaccinations throughout childhood, and an place to store all the child's health information. This will inscribe value in the folder and make the folder a place to keep all health information for the remainder of the child's life, especially for parents who choose not to use the smartphone app. HPV vaccination rates in Allegheny are low compared to standard vaccination rates, and the reasons parents choose to vaccinate or not are complex. Many parents in the greater Pittsburgh area cited safety concerns as their primary reason for not vaccinating. After a failed attempt to mandate the HPV vaccine, the ACHD turned to Carnegie Mellon design students for a solution. After a deep literature dive, our primary inspiration for the ecosystem was the historical context for vaccination decisions. Anti-vaccination groups have been around since the advent of the Small Pox Vaccine in the 1800s. We realized that this problem is not a new one, but rather a cyclical seemingly unavoidable product of fear of new and change. With this perspective informing our direction, talking to people ultimately allowed us to humanize the decision process and understand what parents really want and need was one of the most valuable parts of the research. We leaned heavily on design ethnography and questionnaires as a way to gather key insights and themes about vaccination attitudes, and also as a way to research our design iterations. Teaching: For parents to make informed decisions, teaching them in a way that is interactive, inclusive, and positive is important to learning. Normalization: People react to new and potentially risky medical discoveries in skeptical ways, especially with the fog of misinformation clouding their decisions. Traditional campaigns rely on drawing potentially unwarranted attention to new vaccinations instead of embedding them in a larger system. Personalization: Parents want to feel that the decisions they make and the information they gather belong to them. They want to feel comforted by the authoritative word of real physicians, anecdotes from friends, and they want to feel like the system actually cares for their own child. The “Right Choice” Remembering that parents want to make the “right” healthcare choices for their children is the framework that scaffolds the entire decision-making process for parents. Reputable Information: "Reputable" is highly subjective and can mean whatever their friends share on Facebook, the CDC website, their own doctor’s advice, or television. Previous PSA campaigns and tools largely ignore post-factualism, social media, and the impact they have on decision-making. Agency: For parents, health decisions for their children are about as high-stakes and personal as they come. Parents want to make informed decisions for themselves, so establishing agency in decision-making is important for parents to feel empowered and informed. Early ideation and one woman's wish "for a checklist for [her] baby so she wouldn't forget anything" led us to develop a concept for an app that tracks and reminds parents of all well-child visit health information as well as an interactive, personalized baby book to function as a keepsake and urge parents to track the app. We wanted to normalize HPV vaccines and vaccines inside of a larger system. We created a simple paper prototype of the book that included "stickers," doctor contact information, data visualizations and pockets for after-visit summaries at the doctor's office. We intended that every baby would receive the book at their child's first well-baby visit. Parents told us a book with all available health information about their child would be too overwhelming. But the interactive pockets in the prototype sparked conversation about the need for a centralized location to keep health information about their child. Watching the behavior of the users was the best way to gain insight about the correct design of the object. We traded the baby book for a simplified envelope with the well-baby checklist on it made out of plastic and magnets to stick to the fridge. This option was intended to serve as a constant reminder for the parents as well as a place to keep the child's health information. User Feedback: Parents wanted something that would help them specifically learn about vaccinations, keep track of vaccines, and a way to easily send the vaccination records to the schools. Vaccines were getting lost in a sea of other information. We slimmed the idea down again, while keeping the core concept. Instead of focusing on well-child visits, we focused on vaccinations in general. We added to the app a way for parents to export the records and keep track of the vaccination record digitally, which is something we believe is an added value that will encourage use. 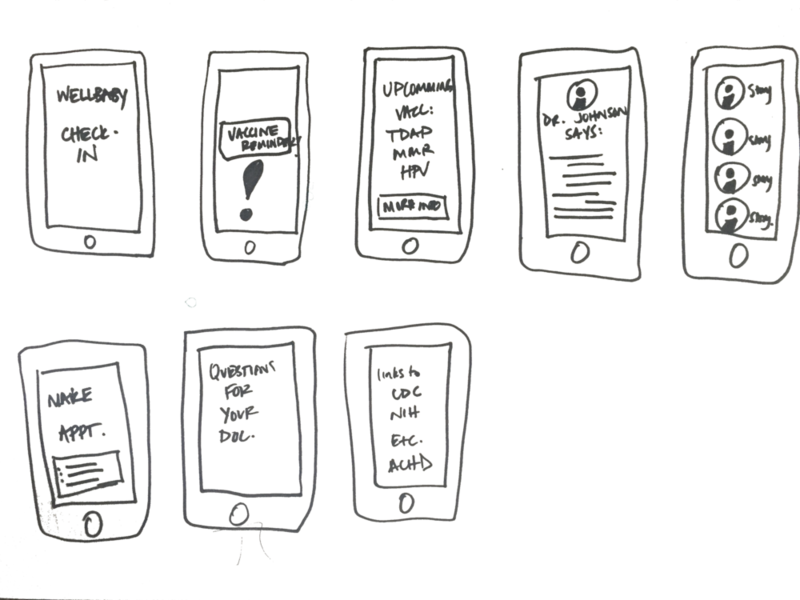 We iterated and tested the app and book/folder simultaneously. Watching users interact with the book and folder prototypes really gave us the direction for the design, but the app went through some iterations along the way. All parents responded favorably to the app portion, so we tested different components in terms of how they would be used. We knew that parents were wary about misinformation, they wanted reputable sources, and that teaching gave them agency, so we incorporated a ImmunityIQ quizzes into the framework. These were meant to nudge parents to read further about the vaccines. We struggled with establishing a community portion of the app because we only wanted reputable information to be available, and adding laypeople into the conversation seemed like the wrong way to accomplish this. To encourage use and help schools and the ACHD collect data we included an option to make appointments, appointment reminders, and automatically send vaccination records to the schools.